Giant whitefly on hibiscus with close up of heavily infested leaves. We're now seeing the aftermath of this long rainy season. The heavier than normal rain has given us velvety green hills carpeted with an abundance of wildflowers. But we cannot overlook the other less pretty things that benefit from a wet winter – lots of weeds and insects. For now, we'll focus on insects. They're already showing up in a news-worthy fashion. KSBY did a feature story on whiteflies and spoke with UC Master Gardener Cathryn Howarth. 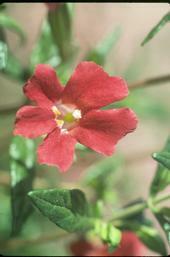 Size: Two varieties, one with leafy stems 2-3 feet, another (dwarf) with mounding, shorter leafy stems up to one foot.